One interesting tidbit about Reika is that she is actually one of the few characters to appear first in the anime1 and then later make an appearance in the manga.2 While it’s certainly possible that Ms. Takeuchi could have already designed the character, made the background story, and shared it with the anime staff, it’s entirely possible that Ms. Takeuchi borrowed the character since her background differs slightly between the anime and manga. And how did they differ? Glad you asked, because the story is not as clear-cut as it could be! 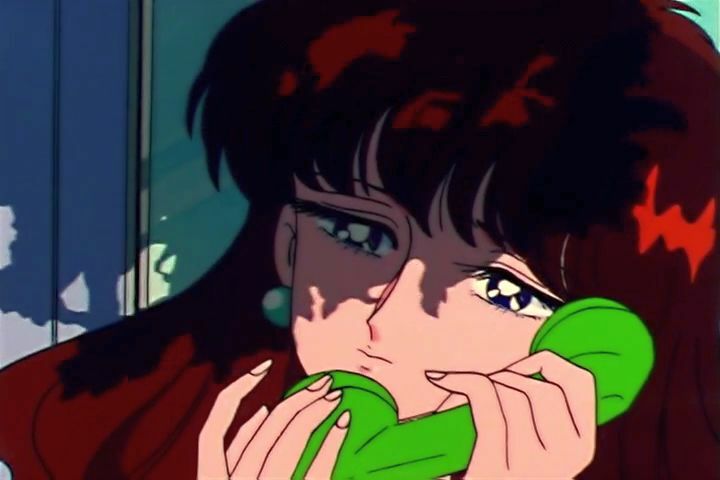 In her first (…and only) appearance in the manga, she mentions that Motoki had left behind a book in their club room,3 suggesting that they belong not only to the same club, but the same university (which would be Keio University, for those keeping track at home). What makes this interesting is that it conflicts with Ms. Takeuchi’s notes in the Material Collection, which states that Reika goes to a nearby all-girl’s technical university. The anime falls in line with the description in the Material Collection, so it’s hard to say which came first. 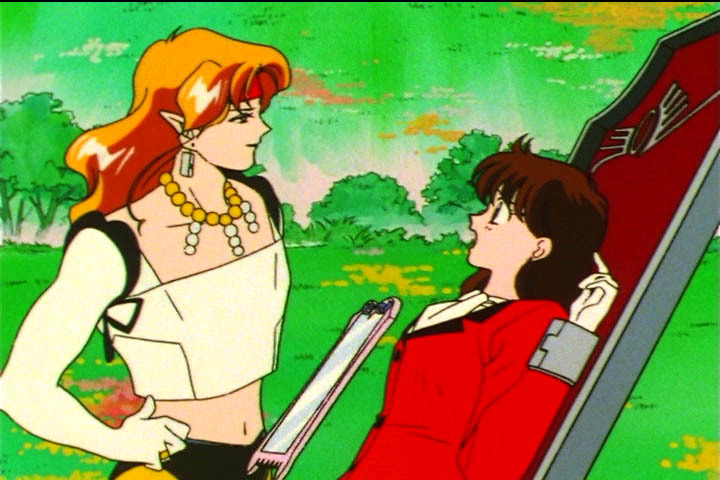 Read also: Why Do Minako and Rei Always End Up Together? Though the former, Kyoritstu College of Pharmacy, may not make sense right off the bat as to how it applies to Reika, it’s worth noting that it was originally established as Kyoritsu Women’s Pharmaceutical Vocational School, an institution of higher learning for getting young women involved in experiments and scientific study. Oh, and it’s also the university where Ms. Takeuchi studied. As for the latter, well, it’s a nearby technical college and in Japanese has a nearly identical name with the one provided in the anime: 芝浦工業大学 (Shibaura Kougyou Daigaku) vs. 麻布工業大学 (Azabu Kougyou Daigaku). So that’s probably where the inspiration behind the name comes, at least! 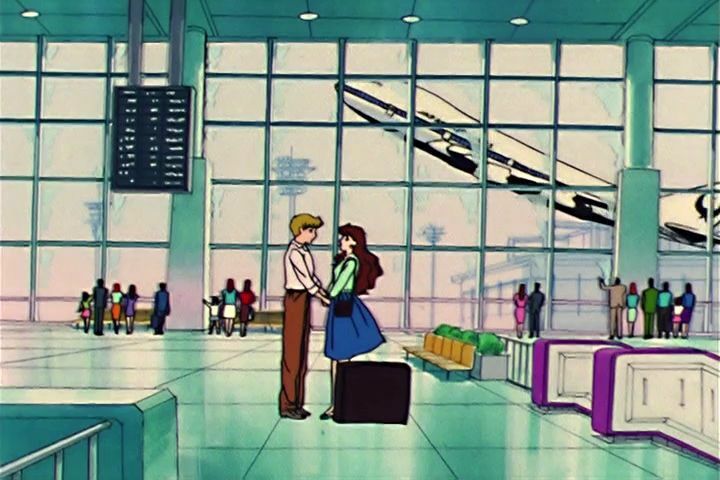 What’s always baffled me, though, is why it is that Reika has to leave Motoki to go study in Africa. I understand that for the sake of the story the anime needs to introduce some sort of trouble in Motoki’s relationship and that it ties nicely into the Rainbow Crystal story line, but her reasoning makes absolutely no sense. According to Reika, she’s going to Africa because it’s the cradle of human civilization and she wants to research this. That sounds nice and all, but with the way Japanese universities (and western universities, too, unless you count her having a minor) work, this is absolutely not something she would be studying at a technical university. She would be majoring in some form of hard science – possibly related to geology or mineral science, maybe? – not something like anthropology, which is what the story describes here. She really can’t make up her mind… now horses?? I wish I actually had an answer for this, since we all know I enjoy being as pedantic as possible and trying to explain away even minor points of the Sailor Moon story line, but unfortunately I really can’t think of any way to explain this other than the story writers goofed up here. Not all’s lost, of course, and by and large the animation staff did a great job and maintaining consistency over their vast cast of characters and well-developed world. But it’s still interesting to see little slip ups like this from time to time! ← Was Sailor Moon Originally Meant to Be Able to Fly? Wasn’t Reika’s research in the anime concerning the origins of *life* and not just the human civilization? In episode 41, she is examining something that appears to be fossilized leaves. Hmm… the way I recall it in the Japanese, it was that she wanted to go to Africa because it was the cradle of civilization, which would imply humanity. I’m not exactly up to date on my study of anthropology, but there was a lot of life all over the world in the form of dinosaurs, and even a lot of other thriving species well before them… so if it wasn’t to study the development of humans, the whole Africa angle makes no sense. Still, it’s a really weird thing for a person in hard sciences to be studying. I really wish we knew more about her major, though! Which is why I actually think she is possibly pursuing a paleontology career… To me it fits with what we see her doing and it’s a a field that also can relate to Geology (and she does have some kind of poles which I assume are geologist type tools for measuring depth) and the study of micro-organsms which is what her youma form was spouting off about and that she seemed to be doing something living specimen related with her professor/co-worker at the school’s research lab?. I’d also like to add that Reika told Makoto her reason for going to Africa was because a university there has a professor she admires and wants to work/study with. While she may have been looking at fossilized leaves or plantlife, it’s possible that she was looking at food sources, maybe? There are many theories abound that early hominids were vegetarian, so that could explain it. Or the animation staff just wanted her to be doing something “research-y” on screen when she appeared. But if she was out looking for the origins of life, she should be out closer to the ocean or in the arctic – far better sources of information on where life itself originated! The problem with assuming that she got a degree in geology and was pursuing a degree in paleontology is her age. I’m pretty sure that Motoki and Mamoru are around 18-19 years old, meaning they’re only 1-2 years into their degree. Though we don’t have a specific age on Reika, we do know that she’s still a student and have no reason to believe that she’s any older than Motoki, so that puts her at 18-19 too, which is too early for her to have gotten a first degree. She’d need to be at least 22/23 to be pursuing a master’s at this point. Also, though her school is called a “tech school,” it’s important to note that it IS a well-respected 4-year university. Of course, this would all be a lot easier to explain if Japan offered minors (I majored in Japanese history, but I have a minor in psychology… so yeah, totally unrelated), but alas, there’s no system like that. Changing majors is also virtually impossible in Japan since it’s more like un-enrolling from your current major and having to re-enroll (including testing) in the new one. It’s definitely an interesting mystery, though! Okay how about this then…looking at Shibaura’s website for example they do mention that they have international partner universities and that they do partake in what is known as the Sandwich program. Age wise if Motoki is potentially in the middle of his 2nd year the she would just need to have been born before April and him after in order for her to potentially be a grade ahead of him right? So assuming that she actually waited a semester after graduating and started in the fall that would allow her to be half a year ahead of him at college? Plus timeline wise I actually think it even lines up really well with Super S (Well…assuming you ignore the second time reset that occurs near the end of S…which unlike the one at the end of the first season this one was not at all explained and was probably not really even intended but has to exist nonetheless in order to get the stupid timeline workable for Usagi to only be entering high school to start Stars and not be older than 16 by the end of Stars. HATE!) such that more than a year has passed since she went to Africa, so she would have returned to Japan and be in the middle of her final year at Shibaura, taken her GRE, and sent in her application to get her masters at an European school which she heard back from in March (I’m assuming Europe is like the US as this is when first acceptance letters start being sent) that she was approved. How bad are the subtitles in Reika’s first episode? I don’t ever see her saying the word humanity regarding her research? Motoki is the only one who explained research at the cradle of humanity (Which makes sense now that I heard the Nairobi airport announcement, it’s going back to the theory that the Garden of Eden was somewhere near there in the RIft Valley.). – Initial conversation with Motoki interrupted by Mamoru…nothing explained at all other than she has not made a decision on something. – Scene with researcher says about raising the subjects temperature. – Makoto confronts her and she only says there is a professor she admires and wants to study with. – Zoisite attack no conversation.other than being confused she is a youma. – Airport scene no mention of why she’s leaving in her goodbye. – in Super S explains she is back from Africa and her research project (no clarification on what it was) was accepted by Euro college. The rest of the conversation for the episode is based on leaving Motoki with no clarification on for what other than following her dream? Of course I still have no explanation why going to graduate school in Europe would mean not coming home for at least 10 years… Is there any logical explanation for that other than manufactured extra drama? Reika actually has another appearance in the manga outside of Act 11! Two appearances to be exact, and they’re during the Infinity Arc (Act 30 and 31). Towards the end of Act 30, Reika makes her reappearance after her quick introduction back during the Dark Kingdom, declining an offer to go out drinking with Motoki and some KO Uni students because she has Mineralogy Club. It’s then that she makes her way to club and discovers that someone new is moving into the empty lab room next door, and of course this is where readers are introduced to Setsuna. In the next chapter, it seems that in that span of time of meeting, Setsuna and Reika have developed a budding friendship at the very least, seeing as Reika appears at the start of the chapter with Motoki to ask if Setsuna would like to join them for dinner. After this scene, and a hilarious bit where Reika shows her blatant jealousy at Motoki bringing up “Mako-chan”, this is the last time we see Reika in the manga. Not too surprising that her focus of studies happen to be mineralogy given Naoko’s interest in the study. As for her anime counterpart, her field of study does seem to be more anthropologically (with an archaeology sub field) based, and while she may be looking for “origins of life” that phrasing itself is sort of vague – she could be doing fieldwork at certain locations with evidence of early hominid activity. Especially since Africa is a go-to continent when researchers are looking for findings in regards to human evolution, particularly with the earlier stages of development. Outside of potential bone and skull fragments, there are many other components that go into the study whether it be their dietary habits, or environment! So, it’s not too much of a stretch, especially with what we see her doing when Endymion finds her in Africa. They may not be fossilized remains of a person, but it’s organic material that could possibly be traced back to whichever period of prehistoric time Reika’s fieldwork is focused on. On the opposite side of things though, it could very well be that Toei just wanted to animate her doing something “research-y” as you mentioned before, and didn’t really think too far into the scene outside of showing her in the process of excavation? It’s kind of amusing how everything about manga!Reika is right there in the open, even though anime!Reika appeared before her and had a “significant role” in season 1 as a rainbow crystal wielder. Also, despite the two seemingly being identical in age it’s silly how much older and mature anime!Reika looks to her manga counterpart. That might just be Naoko’s art style more than anything, but wow!